Overview : THAICOM-3 was a three-axis stabilized spacecraft with a payload capacity of 25 C-Band and 14 Ku-Band transponders. 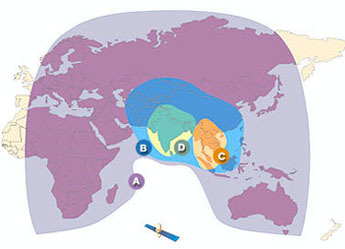 After nine years in operation and relocated to its new position at 50.5 degrees East, THAICOM 3 satellite was deorbited after experiencing power loss to such an extent that it could not provide further service on October 2, 2006. 1160 Kg. At the end of spacecraft's life.